Image Copyright © 2013 Scott Stulberg. All rights reserved. Nicely done my friend. Wish I could have been there with you. Next time! Wow Scott that is absolutely incredible. The stars peeking through the clouds at the top left of frame just caps off an already amazing shot. I have to say that this is one of the coolest photos I have seen in a very long time. Ben’s right, the stars really add the to the shot, and the fact that you captured a lightning impact just adds even more magic to the photo. Perfect execution and impeccable timing – it sure came together for this one! Scott — this shot is simply awesome. I love the composition in its entirety and particularly the stars peaking through the clouds. Would be neat to hear the story behind this shot. Joe Sr.
Glad you like the image. Was such an amazing night. So…the story behind the shot? Well….living in Sedona, it’s a 2 hour drive to the Grand Canyon and with my fiancé Holly and good friend Rolf, we realized that sunset was not really happening , once we were there. As it got very dark, I said let’s pray for lightning and we decided to stick around. We drove to different viewpoints, and when we got to Moran Point, as we were checking it out in pitch black, our dream came true. I saw a huge bolt and then told them ” Yabba dabba doo!! let’s go!!! …and we set up our cameras as fast as we could! I was the only one with a lightning trigger so it was so much easier for me to capture the lightning and we pre focused on our headlamps from very far away as focus in pitch black situations is so dang difficult! Shooting wide angle was what I wanted so the grandeur of the spectacular Grand Canyon was really center stage, and we shot for over 2 hours. The lightning show was insane and the roar of the thunder was as loud as I have ever heard in my life. Made you feel so lucky to be a photographer to be able to witness a sight light this. I was so happy with the long exposures to try and capture the stars too as I love capturing the night sky and teach this in so many of my workshops! Nothing like being in the right place at the right time!! and thank you Ben, Ian and Larry! Appreciate what you wrote. So happy my parents gave me a camera when I was so young. Sure changed my life…..! An amazing photo big guy! Your enthusiasm for inspired photography is cool to witness. This image rocks! But I wanted to say…why does a lightning trigger at night make things easier for you than for other people? It’s pretty simple to just capture lightning via long exposure, I find lightning triggers at night to be useless. Absolutely intense! Thank you for sharing! If you have a good trigger….then it triggers just before you see the strike…and takes the guess work out of it and saves shutter acuations too. Besides…I can just kick back in my chair…relax…and I totally trust my triggers! But hey….to each his own. Many of my friends use triggers and we all love them!! You don’t need one to capture lighting..after dark…but they sure are sweet to have!! but during the day…..you sure do need them as they are critical to capturing good strikes with light outdoors!!! I have a wireless one so I do it from inside the car and hang with my kiddies. But as far as extra firing…I find that when I use a trigger at night, any flash sets it off, so it’s pretty much going off most of the time. Maybe I can reduce the strength, but that’s been my experience. Above all of that though…is lightning happens fast. No matter how great your trigger is or how fast your camera responds…you are missing something if you start the shutter AFTER the initial bolt fires. I want the whole enchilada. Also, how cool would it be to shoot 600 exposures over the Grand Canyon of lightning and then put it together into a timelapse. Appreciate your response, I was just curious. Also Scotty, was just checking out your other work…amazing stuff. all of it is good. Triggers or no triggers. Just getting out there and shooting is what counts. And yes…Many of us fire off 30 second exposures for lighting and it works great too. But the triggers are incredibly fast and do capture it all. My friends are electrical engineers who design some of these triggers and have explained how they work. I love working with them and some of my friends prefer triggering by hand with their cables and remotes. As long as you are out there…that’s what counts!! 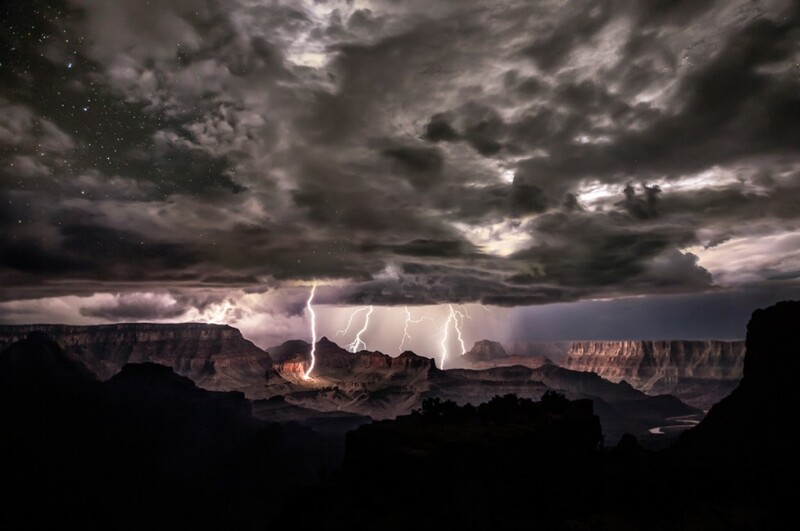 and that night in the Grand Canyon….it fired so much I cannot even believe it! I did make a small time lapse…. was just ok but still was pretty nice being able to do that. Any kind of storm is great Mike! anyway….keep having fun with it all!! nothing to add but to say, this is HUGE!!!!!!!! !, Scotty! Wonderful image, Scott. Why did you need a trigger if you used a 30 second exposure? like I tell others…no one needs a lightning trigger…..although it is pretty nifty if you want to catch lightning during daylight hours for sure….but for after dark….it just makes it a lot easier than always pushing the shutter….whether it is for 10 second or 30 second exposures….. I shot for hours at the Grand aCanyon that night……and I would have had to put a ton of accuations on my shutter…over and over whether there was lightning or not that night… just to try and catch the strikes. With the trigger…it senses the bolts ahead of time and fires the shutter for you. That night It caught every single strike and never gave me a false one… and although my friend Rolf was shooting too without a trigger next to me and doesn’t want to use a trigger…. he saw how cool it was to not have to push the shutter at all ..and I just love great gear that works and makes my life as a photographer easier. So…just like telling Mike above….it’s for some people and not for everyone. For me….I can’t live without my triggers…..
got me the shot above! Love the shot. Really. Is the Lightning trigger you use commercially available? If so, which one is it? Indeed Sctot, would be great to know more about these triggers – can you suggest a link to see what are available on the market, how they work.